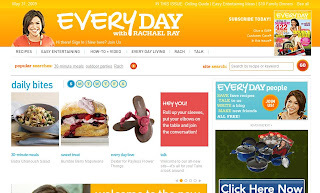 I am happy to say that the website for Rachael Ray's magazine, Every Day with Rachael Ray, got a makeover! I found the old main page overwhelming, so was so excited when I logged on to see a clean and easy-to-read look. In addition to the new, sleeker look, you can now rate and review recipes, which is a treat. I find that despite a few trolls, those reviews and ratings are very helpful. The new feature allowing you to save recipes is also nice and convenient. By the way, I figured this out after running a search for Don't-Kiss-Me Garlic Burgers, which I found over at Unhistoric Acts when starting this week's Roundup. I probably don't even need to say it, but I added the recipe to my list of recipes to try in the left hand sidebar. I might be inspired now to update ERR after seeing this! Update: I spent more time playing around with the site and ran across the Easy Cooking View feature (which is on the right on the recipe pages). How cool is that? As someone who ruined a computer by spilling EVOO on it last year, I really need anything to make bringing my laptop into the kitchen easier.